Lasagna is one of everyone's favorite meals, but that doesn't mean a different spin can't be given to it. 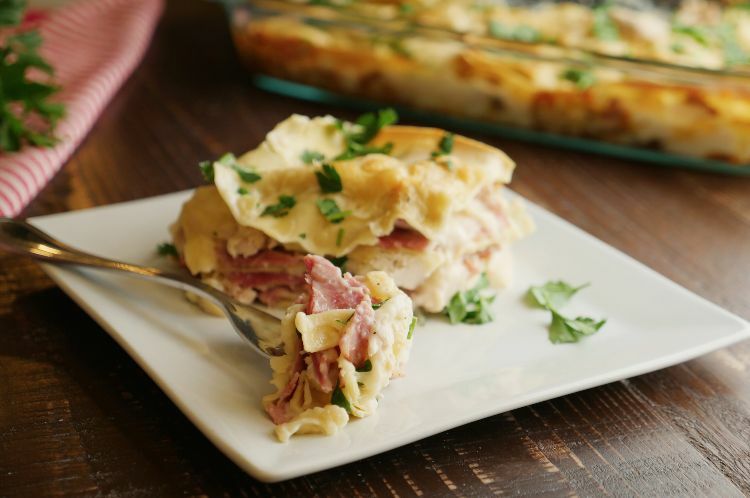 In the recipe that follows, the traditional ground beef is swapped out for chicken and ham, while the conventional red sauce gets upgraded to Alfredo for a creamy and delicious meal. This dish is truly lasagna like it's never been seen before. Not only is this lasagna different, it's also made even easier with a couple of yummy shortcuts. 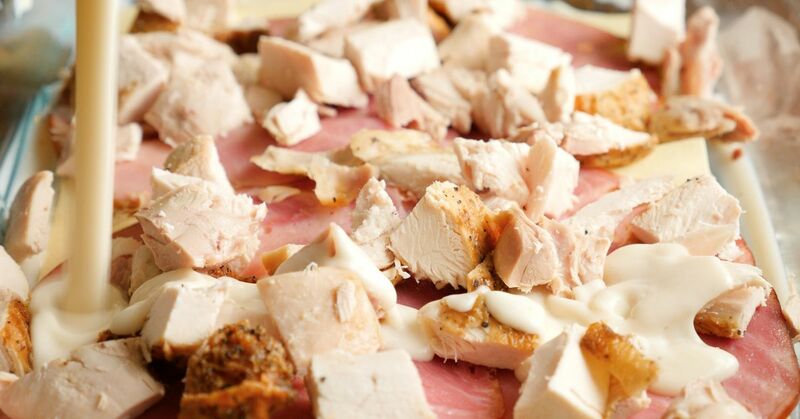 The Alfredo sauce can be purchased from the store, as can the rotisserie chicken, while the ham comes straight from the deli and doesn't even need to be cooked first. These time-savers not only make this one of the tastiest lasagnas to hit any dinner table, it's also an easier one that can be prepared on a busy weeknight. Preheat the oven to 400 degrees Fahrenheit and grease a 9" x 13" casserole dish. Spread a thin amount of Alfredo sauce in the bottom of the casserole dish. Lay 3 lasagna noodles on top of the sauce. Lay 4 slices of ham onto the noodles and then sprinkle 1/2 of the chicken on top. Drizzle with about a cup of Alfredeo and add 1/3 of the Swiss cheese evenly on top. Place 3 more lasagna noodles on top of the cheese. Again layer 4 more slices of ham and the remaining chicken. Drizzle another cup of Alfredo sauce over top and another 1/3 of the Swiss cheese. Top the casserole with the remaining 3 lasagna noodles. Evenly sprinkle the remaining 1/3 of Swiss cheese on top. Cover the dish tightly with aluminum foil and place in the oven to bake for about 45 minutes or until the dish is hot and bubbly throughout, and the cheese on top has melted. If you wish to brown the cheese, remove the aluminum foil and bake for an additional 15 minutes. When you're feeling particularly hungry and craving something rich and indulgent, nothing quite measures up to a hearty beef and potato casserole. Penne pasta, chicken and three different cheeses meet up in a pot before going into a casserole dish to bake in the oven in this tasty recipe. Your little ones will enjoy their broccoli just as much as anyone when it's served with the incredible sauce in this dreamy recipe. If you have the time to let your crock pot cook in advance then all you need to do is add your frozen chicken, a few ingredients and then let the whole thing sit. Hard-boiled eggs seem to be a fast and easy dish with limited cleanup, but peeling eggs in a clean manner sometimes blows that theory.